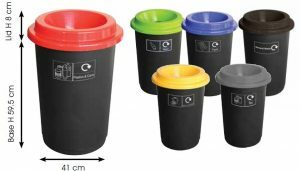 BLACK BIN BASE – £13.45 exc VAT each. LIDS – £7.45 exc VAT each. 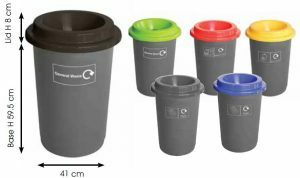 COMPLETE SET INCLUDING GRAPHICS (BLACK BIN BASE) – £19.45 exc VAT each. GREY BIN BASE £15.45 exc VAT each. 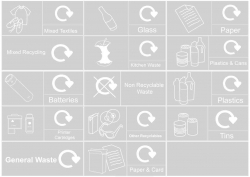 COMPLETE SET INCLUDING GRAPHICS (GREY BIN BASE) – £21.45 exc VAT each. 14 Different Labels, white graphics on clear. Sheet size: 560 mm x 400mm. Individual label size: 185 mm x 78 mm.